What's your name, where do you live and work. 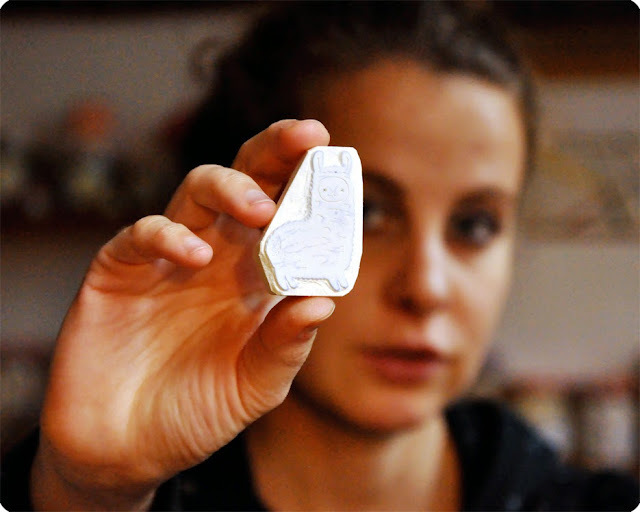 My name is Patricia, I am 31 years old and I am a stamp carver. I live between Paris (France) and Carrara (Italy), my home town. Carrara is worldwide reputed for its white marble. Usually I come to my little town during summer and holidays. I spend most of my time in Paris, where I have my little atelier. What is your background? School, art classes, self taught? I feel to be a rather self-taught in the field of arts and crafts. I always carry out little arts and crafts projects, ever since I was child. For a long time I cultivated this passion only in my spare time. I was student of accounting during high school, and then of philosophy at the university. After my MA in philosophy, I moved to Paris and, here, I maturated the idea to dedicate myself to my real passion. In this town, I followed several art classes and I discovered my love for hand carved rubber stamps, becoming a “compulsive carver”! 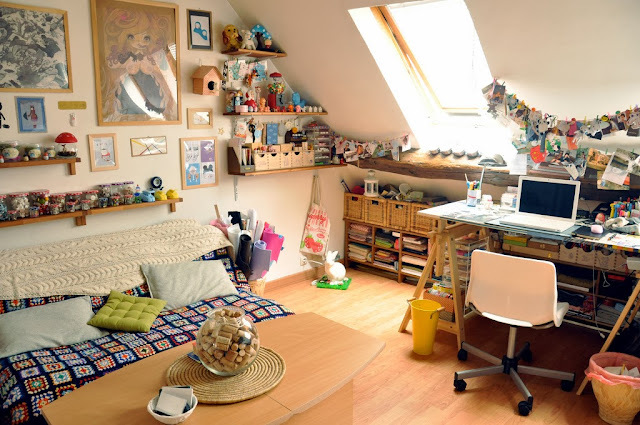 Can you give us a peek inside your work space? With pleasure! This is a picture taken in my very little Parisian attic. Here all my tools and materials are manically organized because the space is very small… and to keep organized here is often a real challenge! What inspires your work? What do you do if you're in a rut? Paris is my muse! I can be inspired by everything that surrounds me: streets, music, people, conversations heard during the queue at the supermarket or in the metro. Here I can find all I need both in terms of raw materials and ideas. For instance, taking my dog Fifi for a walk, or just sitting in a café to watch people walking in the street, to listen by chance a concept and a light turns on. To perceive that I have in front of me all that I was looking for. For a woman like me, who has grown up in a very small town, Parisian streets are a surrounding experience; it is a dream come true to be here. 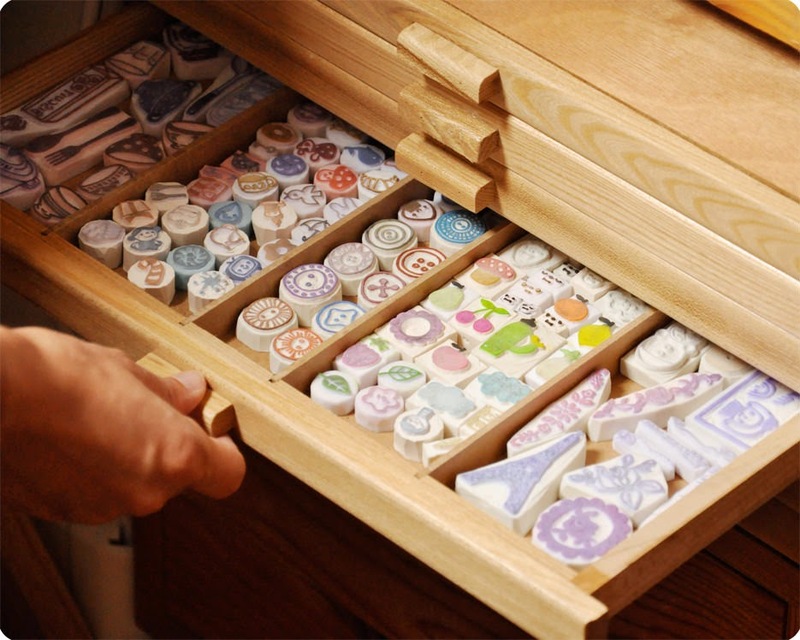 What do you like about hand carving stamps? 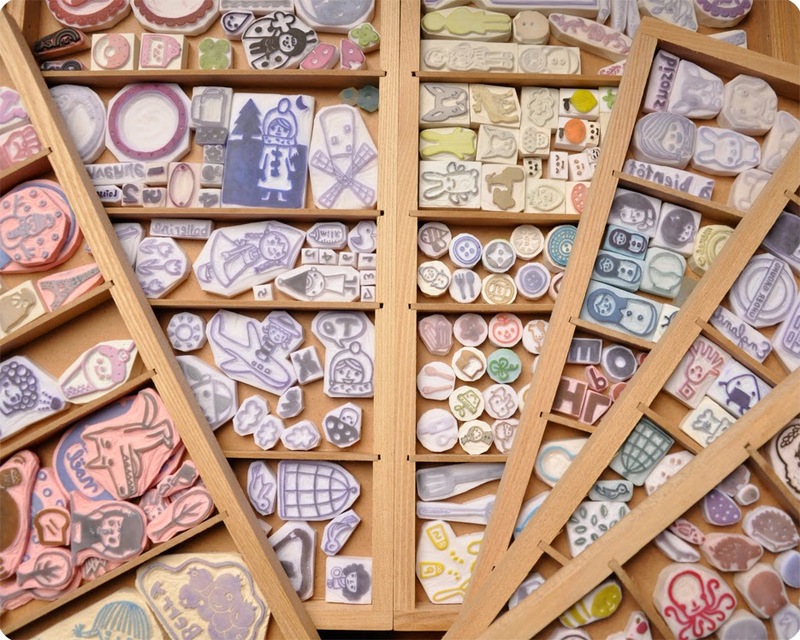 I definitively love all things about hand carved rubber stamps! 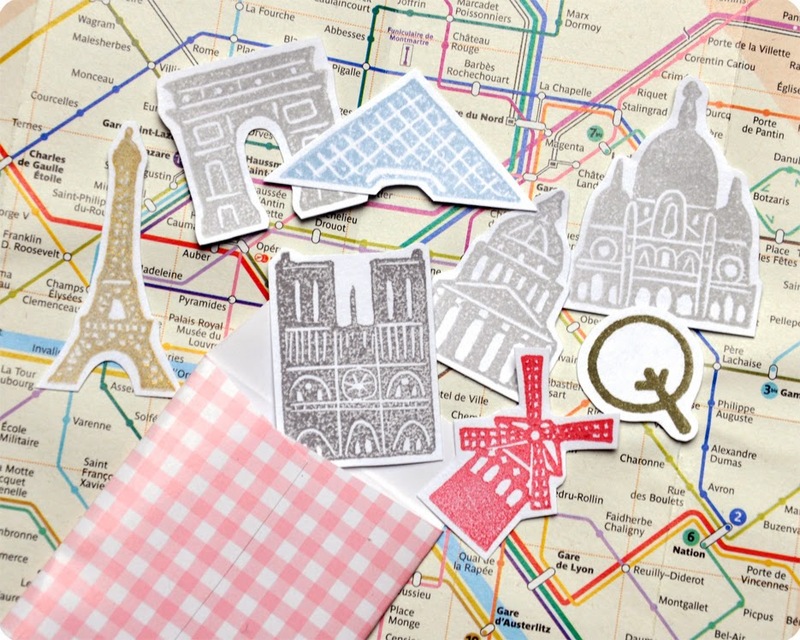 But the main thing that I like in rubber stamps is their ability to turn anonymous stuff into something unique and very original. Old things can transform into something new by a touch of rubber stamp, which helps to make daily living more pleasant. 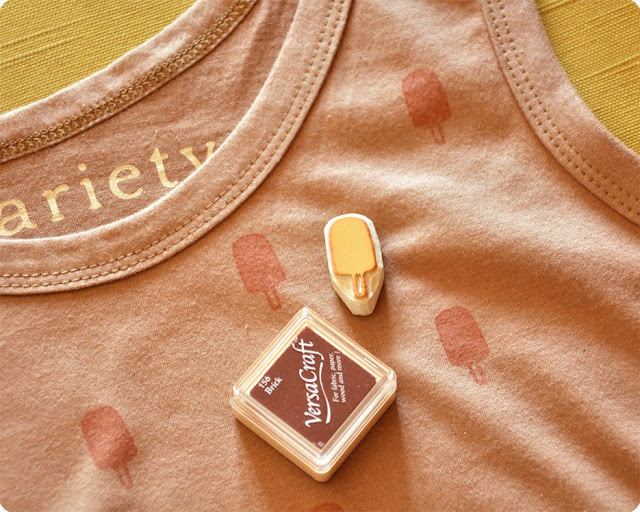 It is funny to rummage in drawers and closets to find out old things to customize with stamps. For instance an old t-shirt or an ancient set of china, once decorated with stamps, gets a new and different life. It's not only funny but also easy! 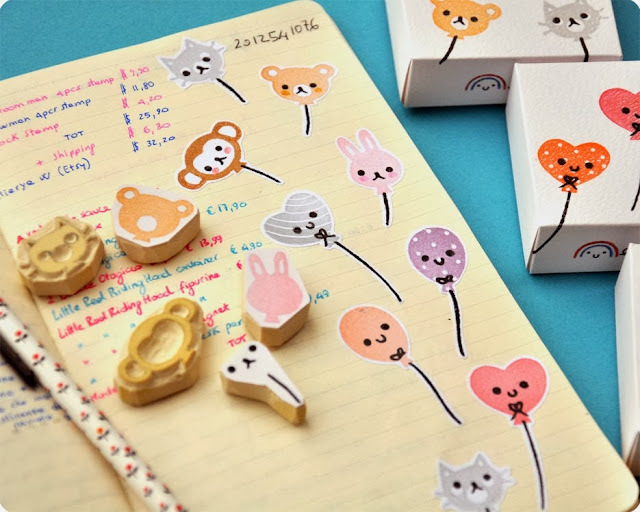 For that, I like to create a lot of designs to be carved into rubber stamps… they are the ground of my personal activity of customization! What do you like about selling your work online? Anything you wish you could change? I like two main aspects of selling my work online. The first is to think that my creations could theoretically be diffused worldwide, crossing the boundaries of countries and continents. The second is to have a direct contact with customers. I like dealing directly with their wills [sic] and assuring by myself a big care to each order and to each detail. What's your favorite product that you sell? Why? 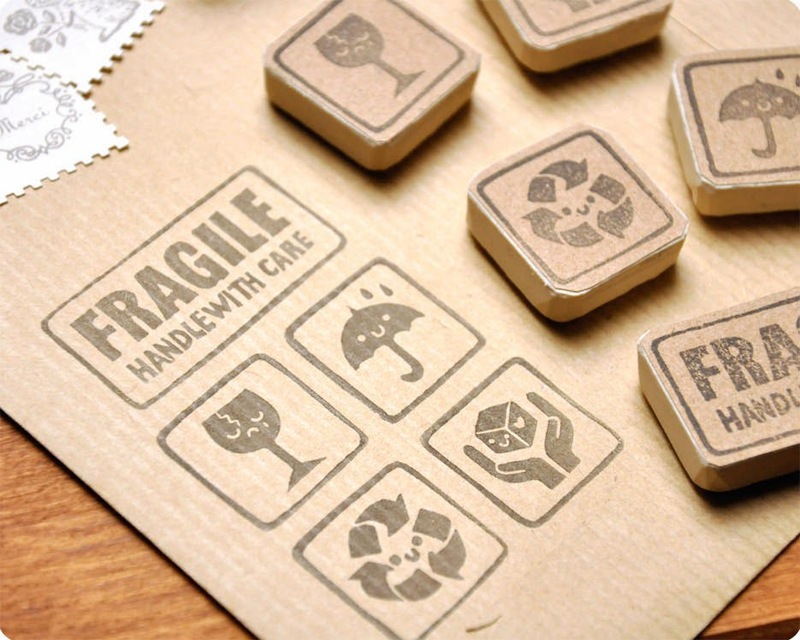 My favourite products are the set composed of many rubber stamps. 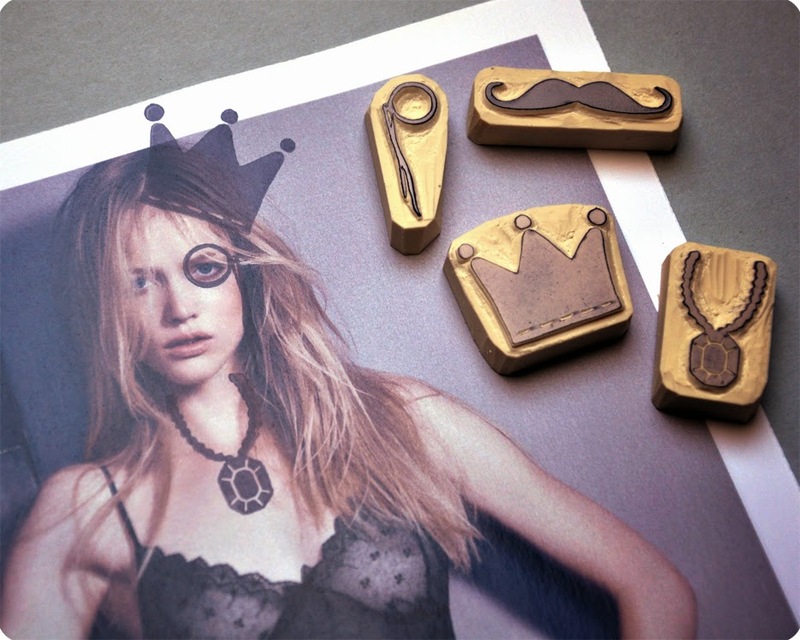 With a set you can find your own assemblage of the designs contained into the set. For instance, one of my favourite sets is the “make me droll” stamp set and "make me queen" which is composed by hats, moustaches, crowns, glasses etc… it is funny to decorate photos or magazines with these stamps turning people in funny characters with moustaches and hats. More recently, I have done some sets with the shape of hot air balloons. Also in this case, the fun is to compose a pattern with smiling face balloons. Do you accept custom orders? What do people ask for? Yes of course, it is a real pleasure for me! For instance, in some cases I worked to create both the logo and the stamp of other mates who sell on-line, in others, I received orders for having stamps with names or portraits. 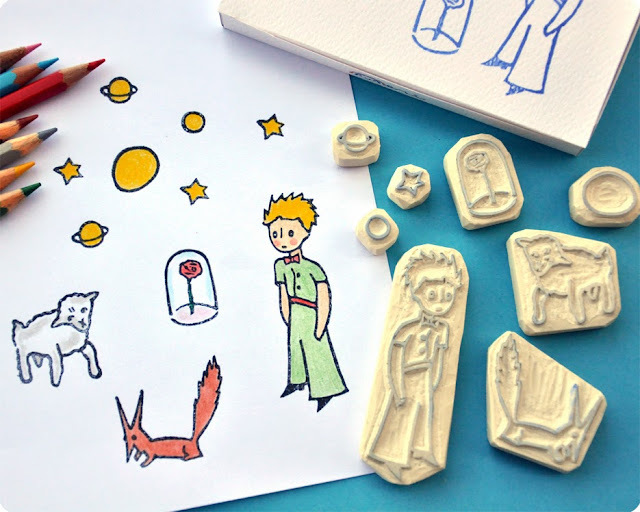 In many cases, I am asked to make a set with the characters of their favourite tales, such as the Little Prince. Where does the name "Memi The Rainbow" come from? I have always used the word "memi" to call little and cute things that I like very much, while the "rainbow" is for me the hope, the force that push me to go ahead even when all seems to go amiss... it is like in this old and famous song that urges to always follow our dreams because "somewhere over the rainbow the dreams that i dare to dream become true"
Have you any special news to share with us? Yes, I have a special announcement: I am waiting for a baby! For that I am back in Italy for a while, to share with my family the happiness of arrival of my daughter! Due to this, my shop isn't filled up with stamps and other creations… but soon I will be back in Paris and my creations will be available again!! Congratulations, Patricia! I have been a big fan for a while (you know this, I have so many of your stamps!) Thank you so much for sharing with us and happy thoughts for the safe arrival of your daughter. all photos courtesy of Patricia/Memi the Rainbow. If you are an artist/maker and would like to be interviewed, please get in touch.